In search of fall foliage, crisp air and short adventures around Fairbanks during the autumn season? We’ve got some suggestions if you are. While the two extremes of Midnight Sun Season and Winter Season lure most visitors to Fairbanks, autumn offers many advantages. From beautiful scenery and golden hills, to special events and winter rates, here are 5 fun things to do in Fairbanks during the fall. A relaxing way to take in the beauty of fall foliage is from the comfort of a rail car. The Alaska Railroad has two excellent “event trains” in September that shouldn’t be missed. Fairbanks Family Fun Train: With two departures on Friday, September 28, 2018 the two-and-a-half hour round-trip journey south features family-friendly games, crafts and snacks. For booking and details, click here. The HooDoo Choo Choo: For those 21-years old and up, here’s a train with a funny name but has seriously good views and brews. Each year in late September, a leisurely roundtrip journey to Nenana serves as the backdrop for sampling HooDoo Brewing Company’s finest craft beer, accompanied by delicious light fare courtesy of Lavelle’s Bistro. This Oktoberfest celebration on rails sells out every year. Click here to join the fun! While Alaskan gardeners are known for their huge cabbages that grow under the midnight sun, a great crop of pumpkins and gourds come into season in September. For a picture-perfect fall setting, head out to Arctic Harvest where they have u-pick Alaska grown pumpkins growing right alongside the barley for their craft whiskey. Their pumpkins are available every Saturday from 4-8pm. If the weather is pleasant, hang out on straw bales, enjoy a hand-crafted cocktail and snag a totally instagrammable fall picture. Also, fun fact - Fairbanks is home to four distilleries, each making their own unique spirits. So if picking pumpkins aren&apos;t your thing, and neither are pumpkin spice lattes, head to one of our local distilleries for a cocktail that will warm you right up! Take a drive north on the Elliot Highway and grab a slice of their famous pie at the Hilltop Truck Stop. Head out on the Steese Highway to the Chatinika Lodge for lunch and check out the historic Chatinika gold dredge. 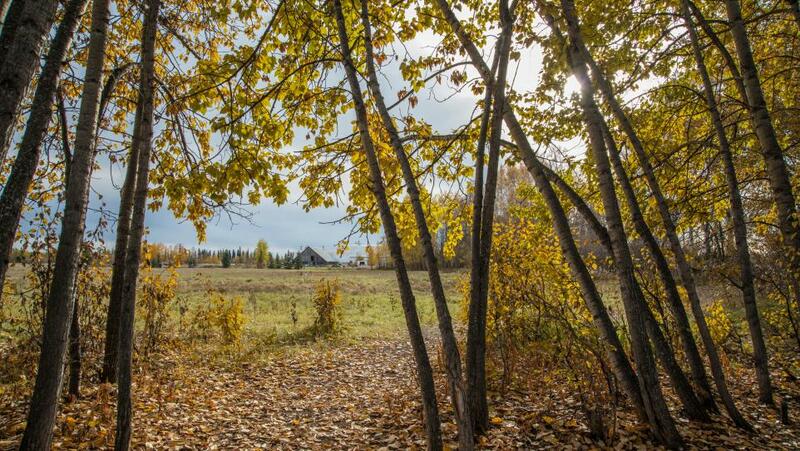 The Wildlife Sanctuary: Located at the Wedgewood Resort and Bear Lodge and next to Creamer&apos;s Field, this 75-acre wildlife sanctuary features a pristine boreal forest with easy walking nature trails leading around Wander Lake. Several self-guided Discovery signs inform visitors about the flora & fauna at the sanctuary. UAF Trail System: One of the ways in which the University of Alaska Fairbanks (UAF) distinguishes itself is through an institution-wide affinity for the outdoors. Fittingly, their slogan is “Naturally Inspiring.” UAF maintains an in-town trail network for skiing, hiking, snowshoeing, biking, and running that is directly accessible from campus (also very popular with dog walkers). Fall weather AND the aurora? Yep! Many people think that watching the northern lights are a cold-weather-dead-of-winter activity. This is just simply untrue. Fall is the perfect time to chase the aurora without having to worry about bundling up in multiple layers of clothing. 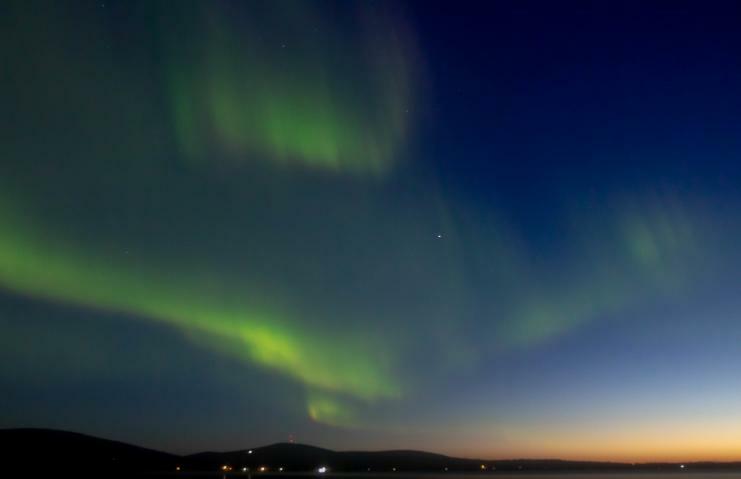 It also gives aurora chasers the opportunity to see early evening twilight auroras that are truly beautiful and unique. Whether you go with a guide or head out on your own, the possibility of catching a light show can be predicted using our real-time Aurora Tracker tool. In autumn, local arts and entertainment kicks into high-gear. The Fairbanks Drama Association, now in its 56th season, begins their season each September to the delight of local and visiting theatre buffs. The Fairbanks Concert Association kicks off their season each October and features high-energy shows in a wide range of genres, from comedy, to Grammy award-winning artists and contemporary dance. And after perhaps taking a hiatus during the busy summer months, people flock to First Fridays once again at local galleries and art spaces. Check our community event calendar for October artist openings. Want to plan on joining the fall fun? Request or view one of our visitors guides and start dreaming of experiencing the short autumn season in Fairbanks!